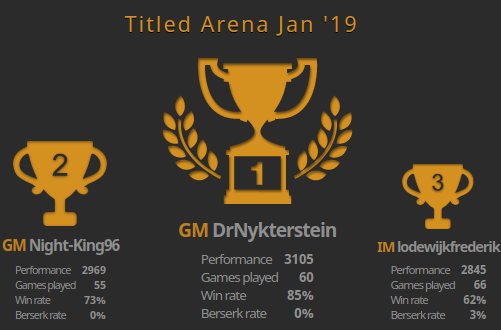 In stark contrast to last December's photo finish, Magnus Carlsen (DrNykterstein) cruised to victory in the January Lichess Titled Arena. The World Champion finished 56 points ahead of a field of over forty Grandmasters, seventy International Masters, and a server that only through the valiant efforts of Lichess's volunteer staff survived a record 42,291 online players. In second place was the Ukranian Grandmaster Oleksandr Bortnyk (Night-King96), and in third one of Magnus's trickiest rivals in previous arenas, the wily anonymous International Master lodewijkfrederik. To give a sense of Carlsen's dominance, after his "customary" first round loss he dropped only three out of his next 58 games (minus one from technical difficulties), and at one point managed to put together a mind boggling 22 game win streak against the best blitzers in the world. Thanks goes once again to Magnus for joining (and, for the eighth time, winning) the event, Lichess's indefatigable crew for putting it on, the hundreds of participating masters who made it one of the strongest online tournaments ever, and for the record number of players on Lichess that day without whom all this would be a bit silly, really.